The gender pay gap is something which many workers wish was a distant memory; or just something that never existed in the first place. Although it seemed that matters had died down regarding the gender pay gap a few years ago, the recent realisation that it still very much exists has caused a fire which won’t be calming down anytime soon. With this pressing issue in mind, we decided to speak to digital marketers from a variety of different backgrounds, to see if there’s an obvious pay gap in our beloved digital marketing industry. From marketers working in content and design to marketers working in paid search and SEO, it’s safe to say that every corner of the digital marketing world was inspected. The results were pretty eye-opening, and as hard-hitting as it may be, we found some results which can’t be ignored any longer. We were initially interested in seeing if Digital Marketing as an industry had a wage gap between men & women. As a progressive industry, we assumed at first that there would be a minimal disparity in pay. But, to find out, we created a 10 question Survey and pushed it out to Digital Marketers across the UK. 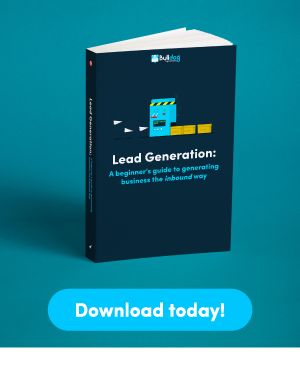 We used LinkedIn & Twitter as primary tools to push the survey, but also got in contact with high-level staff at digital marketing companies to share the survey with their team. Come the end of the survey, we had 174 responses from marketers across the UK. Be aware that some of the datasets may not be incredibly reliable, on account of small sample sizes for some demographics. This survey revealed a few uncomfortable truths about the digital marketing world. We learned very quickly that we have a way to go as an industry to reach acceptable levels of diversity, as it turns out there’s an awful lot of white people in digital marketing. 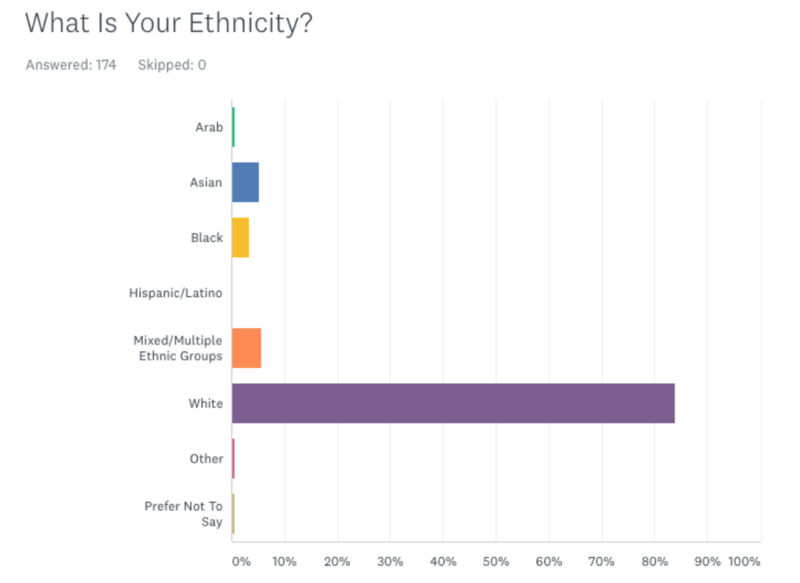 Around 83% of all our respondents were white, with just 16.1% of respondents being People of Colour (Black, Asian, Middle Eastern, Mixed Race or Hispanic). Although this was a disheartening finding, we discovered that P.O.C are represented reasonably well when you take in to account that they’re a smaller population group. According to IndexMundi around 87.2% of the UK population are White, compared to 12.8% of the population that are P.O.C, so despite a surface level lack of diversity, you can see that digital marketing is an inclusive industry, but we still have a way to go to promote people of all races being on even footing in the digital world. Unfortunately, due to a smaller sample pool, we couldn’t accurately find whether there was a verifiable pay gap amongst different ethnicities in the digital world. 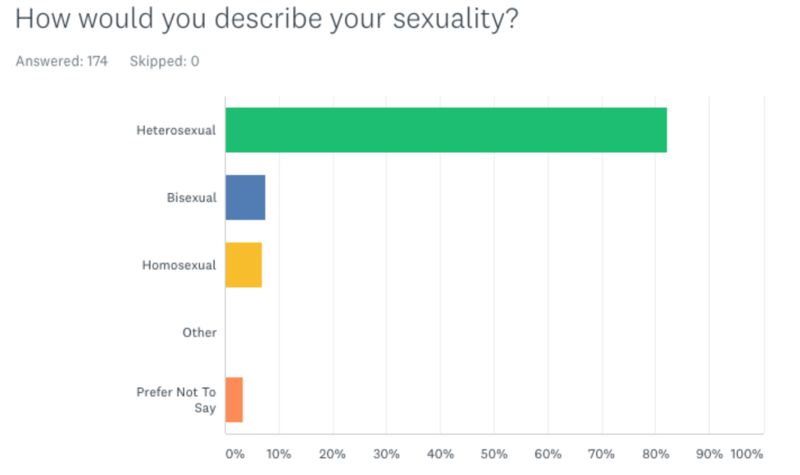 Another thing we looked at in the survey, was the respondents sexuality. We asked the simple question as to whether the respondent was Heterosexual, Homosexual or Bisexual, with options to note if they didn’t conform to those sexualities or if they preferred not to say. This shows that heterosexual people still make up the biggest chunk of the industry, 82.1%. There was also strong signs of inclusion of non-hetero marketers, with 7.47% of the industry being Bisexual & 6.9% being homosexual. 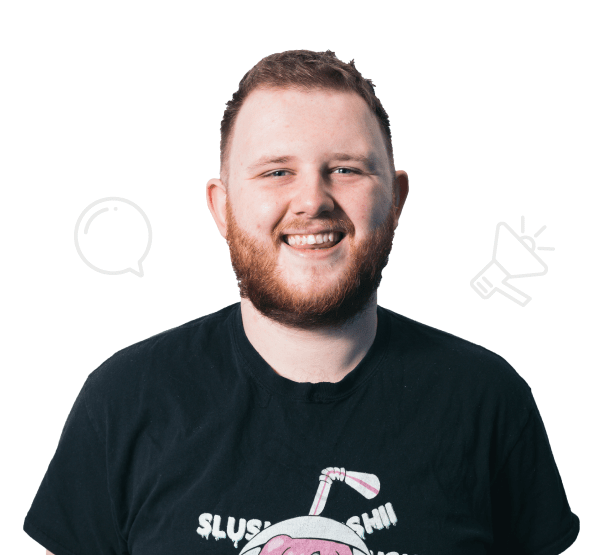 According to the ONS, around 2% of the entire UK population identify as Lesbian, Gay or Bisexual, so this shows a clear sign that the Digital Marketing industry is accepting of all people, no matter who they’re attracted to. 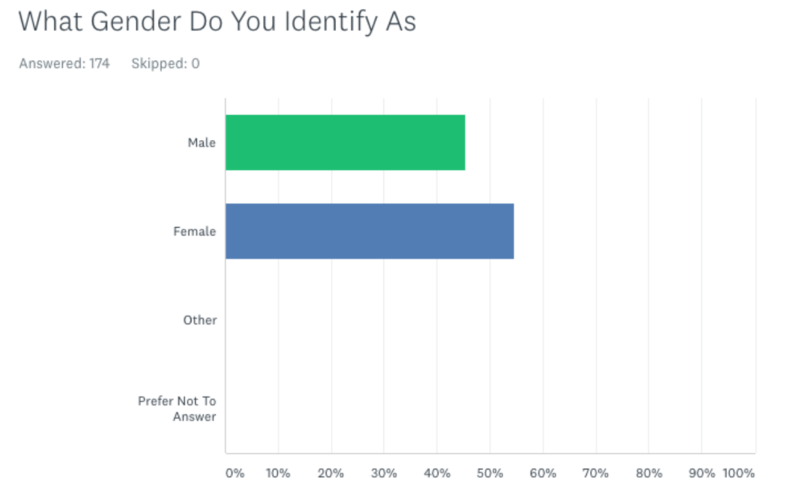 Our survey responses when it came to gender, were very close to each other. It ended with a split of 45.4% of respondents being male & 54.6% of respondents being female. This split is rather close to the actual male-female split in the UK with 49% of people in the UK being male & 51% female according to the government. Many people have the idea the digital marketing is somewhat of a ‘men’s club’ but it’s good to see that according to our study, the gender split is representative of the country as a whole. Now we get around to the big question of the study, does the digital marketing world have a wage gap? Yes, yes we have an issue with a pay gap. Across all our respondents, men on average earned £33,916, compared to the average salary of our women respondents that was just £26,923. That is a whopping difference of £6,993 a year. So, just looking at the top level data is quite alarming. But, obviously, just looking at the average salary of all men & women isn’t an accurate measurement. In our sample, we had a varied level of experience of men & women in various different sectors of marketing. It would obviously be more beneficial to compare salaries along with experience to get a clearer picture of the gap… so that’s what we did! We noticed that although there is a clear trend of men having a higher salary early on in their careers, our female respondents out-earn their male counterparts. This shows that early on in their careers, our female respondents are out-earning the male respondents, all the way up until the third year of their career. 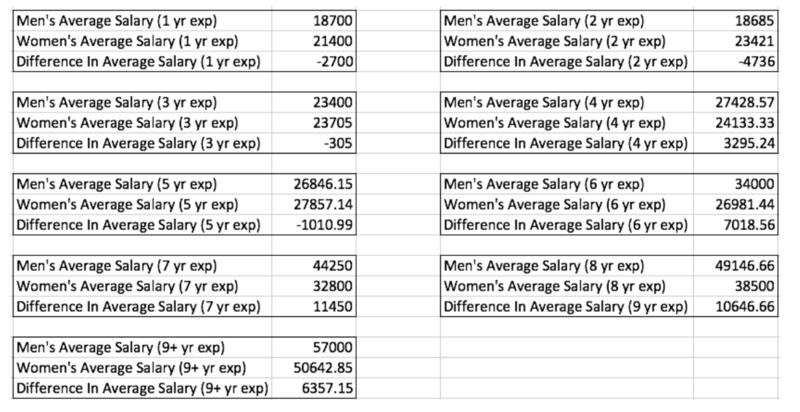 We also notice that the salary for females gradually improves year on year, but for men it stagnates for a while, then takes a larger jump every couple of years. You can see that at the moment, towards the more experienced end of the scale, men outearn women quite significantly, at about £6,357 more a year with 9+ years of experience. This is an alarming disparity between both men & women and it needs to be addressed. After seeing that the industry has an apparent issue with a wage gap, we decided to look deeper into the issue and looked at what sectors of Digital Marketing have issues with equal pay & what the disparities are. We discovered that in SEO, Strategy and PPC, men greatly out-earned their female counterparts. In Content Marketing, the average salaries were closer together, with only £1653 difference in salary. The only we looked at, where women earned more than men on average was social media, where women out-earned by around £5,500 a year. All in all, there are massive differences in women’s & men’s average salaries in the Digital Marketing world & it is something that needs to be addressed. Digital marketing is seen as one of the more progressive industries and we’re still far behind where we need to be when it comes to having fair & equal pay for men & women alike. This research may be hard to come to terms with, but every cloud has a silver lining, and we can now use these findings to improve the digital marketing industry. It’s time to give all the hard workers the recognition they deserve. If you’re great at your job, then why should factors such as gender and race matter? Take a step back and look at your own organisation; do these problems exist between your four walls?